Mix 25g Waitrose Wholesome Sesame Seeds with a very finely diced, deseeded red chilli. Press 2 x 150g pieces Icelandic line-caught skin-on cod fillet into the seed mixture to coat. Heat 2 tsp sesame oil in a non-stick frying pan and add the fish. Cook gently for about 4 minutes (skin-side first) on each side or until the fish is opaque and the crust is golden. 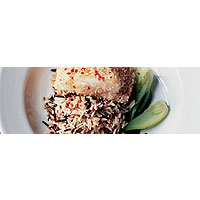 Serve with Waitrose Wholesome Brown Basmati, Red Camargue and Wild Rice and steamed pak choi, drizzled with soy sauce.